In her third book inspired by First Nations’ stories, children’s author and illustrator Caroll Simpson explains the significance of community values. She introduces readers to a world of creatures like Sea Lion, Killer Whale, Dogfish and Kingfisher. Her dramatic tale of young twins and their transformation shows how working together keeps a community healthy. 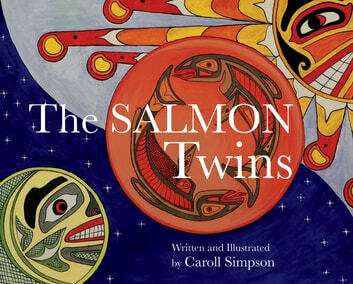 When new twins are born in a mythical Pacific Coast village, everyone celebrates because the birth of twins is a rare occasion; twins are the children of the salmon. But when the twins grow selfish and greedy, Thunderbird transforms them into a Two-Headed Sea Serpent. Can the Serpent’s heads learn to work together? The question becomes more important when the salmon don’t run up the river and the villagers start to go hungry. The Serpent’s heads have to co-operate with each other to solve the mystery and restore the salmon run. Written for children aged 3 to 10, this charming story is illustrated with Simpson’s distinctive colour paintings that celebrate First Nations culture. A glossary of mythical creatures and sea life provides informative teaching points and invites further exploration of West Coast cultures.